Discussion in 'Reviews and Tests' started by jasonX, Aug 11, 2018. WinRAR is the world's most popular compression software! 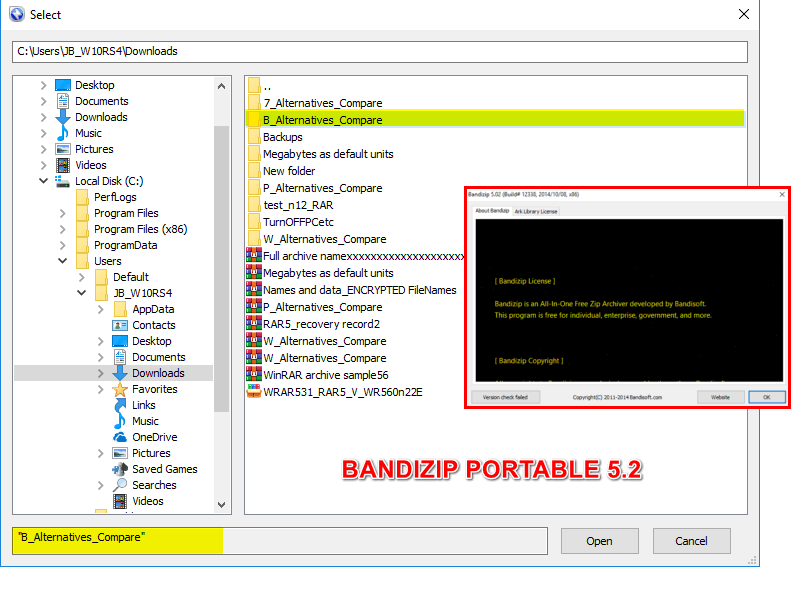 This compression software offers a full list of quality ZIP features and supports a host of extraction formats. You can compress files into RAR 5, RAR 4, and ZIP archive formats and can extract a number of different archives. This ZIP software supports the extraction of 14 archive formats. In addition to RAR and ZIP, these include RAR, ZIP, 7Z, ACE, ARJ, BZ2, CAB, GZ, ISO, JAR, LZ, LZH, TAR, UUE, XZ, Z, ZIPX and 001. 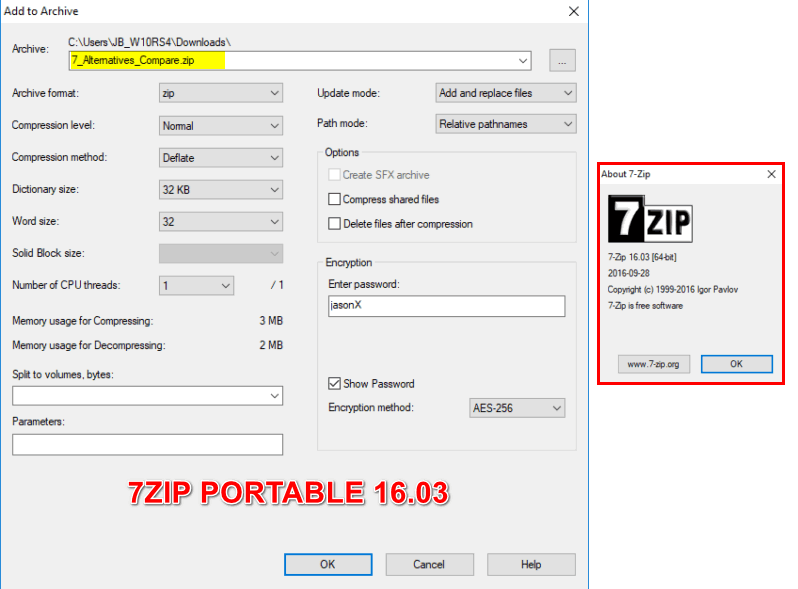 In this new version 5.50 RARLabs has added extraction support for .LZ archives created by Lzip compressor, inclusion of LZ and ZIPX are added to list of associations in Settings/Integration dialog and LZ and ZIPX extensions are added to default list of formats for -ms switch ("Specify file types to store") invoked without parameters. WinRAR scores high in our extraction format category. The first WinRAR version, with the proprietary RAR format, was released in 1993. The format is a chief rival of the ever-present ZIP format. Though you can only compress files into the two formats, this ZIP software lets you unzip 14 different formats. The most notable functions of WinRAR include very powerful document and multimedia file compression, file encryption, processing of other archive formats, programmable self-extracting (SFX) archives, damaged archive repair and Unicode support. WinRAR also can scan your archives for viruses before you extract the files. This application's most user-friendly aspects are the drag-and-drop feature and the Archive Wizard. WinRAR automatically detects the type of files you are compressing and adjusts the compression rate accordingly. WinRAR uses a traditional display involving menu trees that lets you go to your archive folder and drag the files or folder into WinRAR. (2) Command line console (text mode) version - Rar.exe. WinRAR and WinRAR self-extracting modules require Windows XP SP3 or later. Recovery volumes allowing to reconstruct missing parts of multi-volume archives. The WinRAR shell may be in one of two basic states. There are similarities and differences among this basic states and the user must be capable to understand what or where he is working (either basic states) in order that he may obtain the best performance of WinRAR. User also needs to be careful, say, the "Delete" command which differs in both states. See further explanaion and images in "DELETING CONTENTS OF AN ARCHIVE". 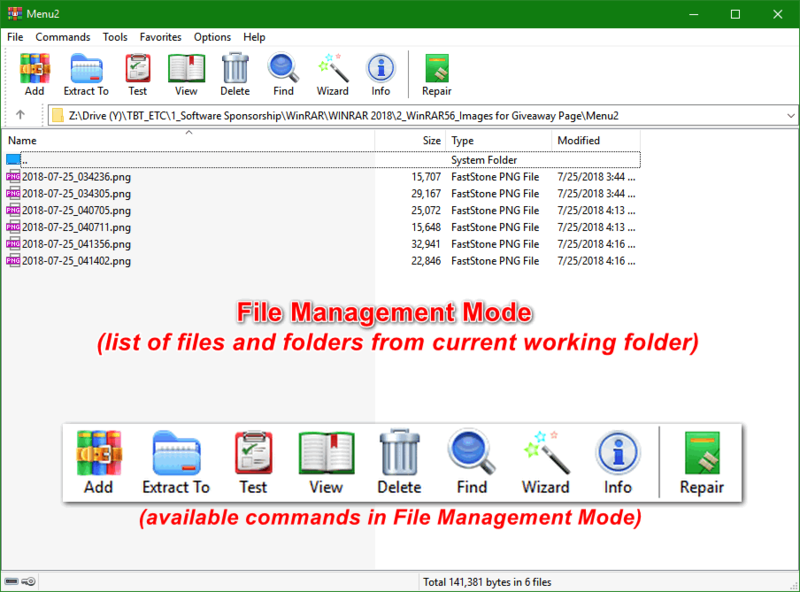 In the file management mode, a list of files and folders from the current working folder is displayed. It is the folder where you intend to make/derive an archive. To go to file management mode you can just double-click the WinRAR icon. From there you can select files and folders in the usual Windows fashion, with a mouse or keyboard, and perform different file operations such as archiving or deleting. Also in this mode it is possible to perform test and extract operations with groups of archives. In the archive management mode, the list of archived files and folders from the currently opened archive is displayed. It is the mode when you open an archive to be viewed in WinRAR. You also may select files and folders and perform archive specific operations such as extracting, testing or commenting. When you run WinRAR you will see "Main menu" along with th icons that you will need to get you started. The Main menu are: (1) File (2) Commands, (3) Tools, (4) Favorites , (5) Options and the (6) Help menu. See the images below for a view of the contents drop-downlist as you click each one of them. From the Main Menu you can set the general configuration of WinRAR via Main Menu > Options > Settings. This further displays the following WinRAR settings: General, Compression, Paths, File list, Viewer, Security and Integration. Selecting this will give a file "Settings.reg" for you to save. The default location is C:\Users\Xxxx\AppData\Roaming\WinRAR but you can also select a location of your preference. Selecting this allows you to load your saved settings from the default settings location (C:\Users\Xxxx\AppData\Roaming\WinRAR) or a location you previously had set. 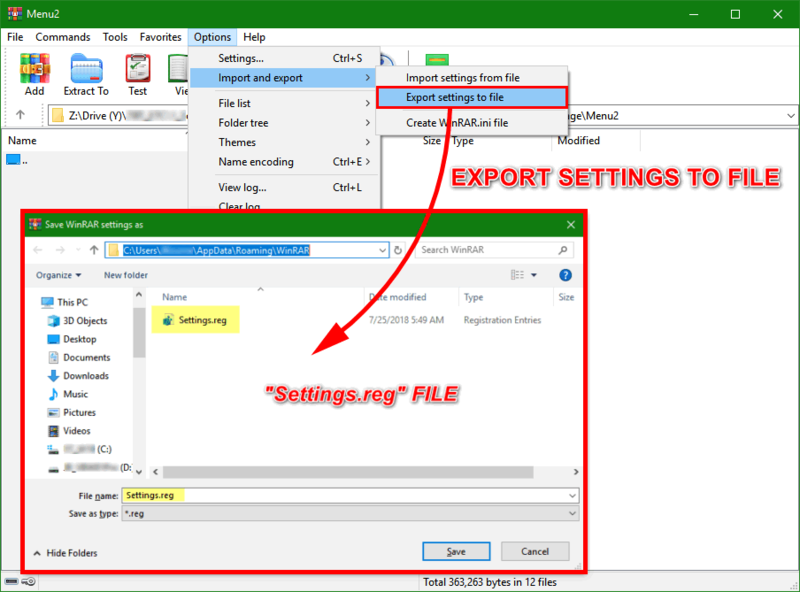 By default WinRAR first searches the Registry but if "Settings.reg" file is present in WinRAR own folder (WinRAR.exe location) or C:\Users\Xxxx\AppData\Roaming\WinRAR folders, it will be imported automatically. A restart of WinRAR is needed to apply some of imported settings. (c) Create a WinRAR.ini file. Selecting this creates a new "WinRAR.ini file" and copies existing WinRAR settings from Registry to this file. (You can also select a location of your preference). 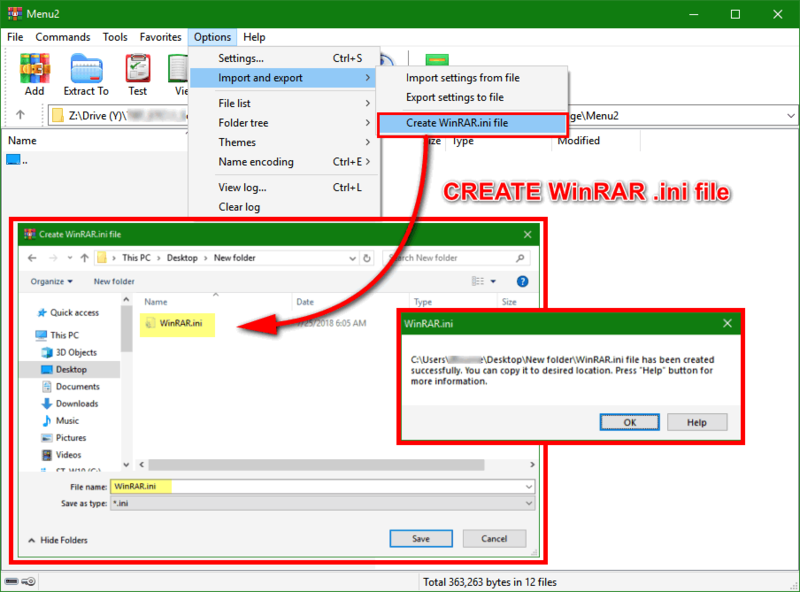 You need to copy a file created with this command either to WinRAR own folder (WinRAR.exe location) or to C:\Users\Xxxx\AppData\Roaming\WinRAR to make it active. You export "Settings.reg" if you wish to move your settings to another computer. You create "Winrar.ini" file if you wish to have a portable WinRAR version, such as on USB flash drive, which stores most of settings in ini file and not in Registry. Directly below the "Main Menu" are the File / Archive Management Command tools. Available command buttons change depending on what mode you are in (file management mode or archive management mode). 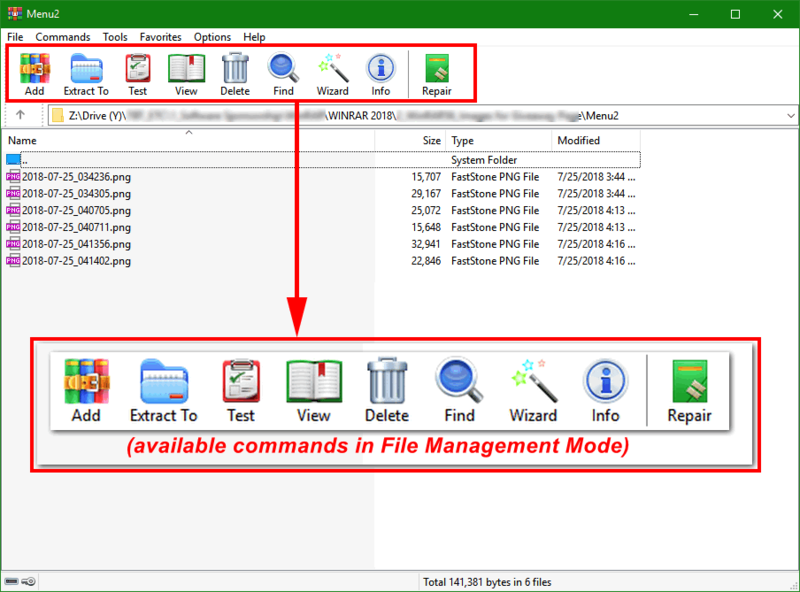 For file management mode avilable command buttons are (a) Add, (b) Extract To (c) Test (d) View (e) Delete (f) Find (g) Wizard (h) Info, and lastly (i) Repair. 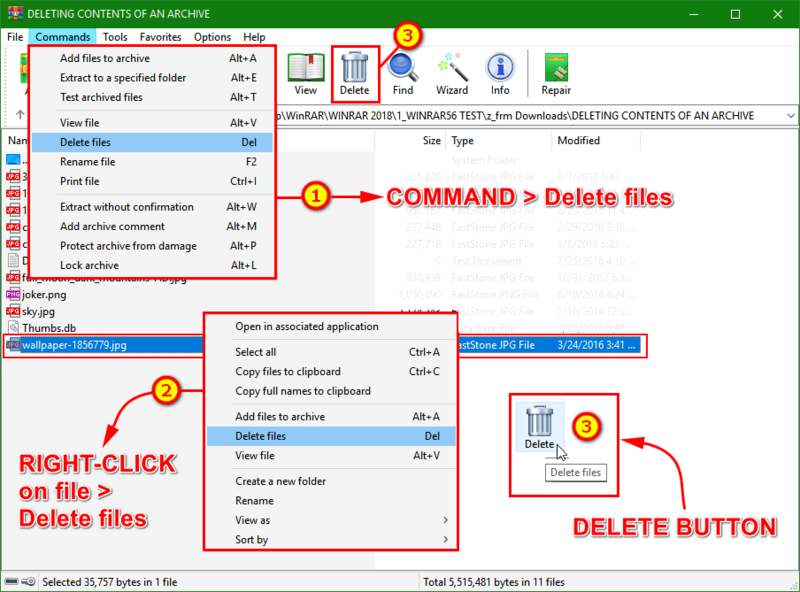 For archive management mode avilable command buttons are (a) Add, (b) Extract To (c) Test (d) View (e) Delete (f) Find (g) Wizard (h) Info (i) VirusScan (j) Comment (k) Protect and lastly (l) Repair. You can also set/select further toolbar buttons via Options > Settings > General > Buttons. To the normal user (like me) the default buttons is enough and will almost always be your guide and a good place to start WinRAR with ease. See below image. This will be easier if you have enabled "Integrate WinRAR into shell" option when installing WinRAR. Select the files you are going to compress, in Explorer or Desktop, "right-click" mouse button on the selected files and choose "Add to archive…", "Add to <archive name>...", Compress and Email...", and "Compress to <archive name> and email". A dialog box will appear -- "Archive name and parameters". Selecting one or more files, enter a destination archive name in the dialog box -- "Archive name and parameters" or just accept the default name given. Also in this dialog box you may select the parameters that you would like to use or change. "General > Compression method --to either fast, best , fastest"
"General > Comment"--where you can type-in a description of your archive. Click "OK" to start the archiving process. An archive will be created in the same folder as the selected files. During process/operation a windows will be displayed showing statistics. If you wish to break or stop the the archiving process just click the "Cancel" button in the command window. If you want to "minimize" it and let it run in the background, there is a "Background" button that you can use. Upon completion the command window will disappear and the newly created archive becomes the current selected file in WinRAR. Much faster is by using drag-and-drop, just select the file/files and drag-and-drop it to an existing archive icon and drop them. Files will be added to this archive. To me as a long time WinRAR user I change settings depending on my needs if the files are sensitive or not or it has to be sent via email or I want it to be opened out-rightly when the file is received. For ordinary archiving/compression I use the default/normal with or without password protection. For beginners, the "Add" button in the WinRAR window or the "Wizard -create a new archive / add files to already existing archive" will be much simpler. The use of the Main menu > Commands > "Add files to archive" command is perhaps tailored for the conventional minds. Run WinRAR by "double-click" or press Enter on the WinRAR icon or via Windows "Start menu": enter "Programs". WinRAR will then display a list of files and folders in the current folder. You need to go to the folder, which contains files to archive. You need to click on the small disk icons in the bottom left corner, to change the current disk. Click the "Up arrow" button below the toolbar or double-click on the folder named ".." to go to the parent folder. "Double-click" on any other folder to enter that desired folder. Select the files and folders you are going to archive. Having selected one or more files, click on the Add button at the top of the WinRAR window, or select the "Add files to archive" command in the Main menu > Commands. Enter the destination archive name in the dialog box which appears or simply accept the default name. You may select, in this dialog, the format of the new archive (RAR or ZIP), compression level, volume size and other archiving parameters. This dialog described in details in Archive name and parameters dialog topic. Click on the OK button when you are ready to create the archive. Add files using drag-and-drop, to an existing RAR archive can be achieved by selecting the desired archive in the WinRAR window or "double click" on its name. Now add files to the archive by simply dragging them from another program and dropping to WinRAR. If an archive extension is not specified, WinRAR will use the default archive format selected in the default compression profile, but you may override it by specifying either .RAR or .ZIP extension. to add all files with .EXE and .COM extensions from the current folder to ZIP archive TOOLS. If you wish to stop the the archiving process just click the "Cancel" button in the command window. If you want to "minimize" it and let it run in the backgroud, there is a "Background" button that you can use. If archiving is completed without problems, WinRAR terminates. Diagnostic message window is displayed in case of error. An SFX or SelF-eXtracting archive is an archive, merged with an executable module, which is used to extract files from the archive when executed. Thus no external program is necessary to extract the contents of an SFX archive, it is enough to execute it. Nevertheless WinRAR can work with SFX archives as with any other archives, so if you do not want to run a received SFX archive (for example, because of possible viruses), you may use WinRAR to view or extract its contents. All SFX archives usually have .exe extension as any other executable file. People nowadays use SFX archives as a convenient way to send a file to someone else, but do not know, if they have an appropriate archiver to extract the files in the archive. To create an SFX archive from the command line or via WinRAR shell either select "Create SFX archive" option in Archive name and parameters dialog, when creating a new archive or enter into an already existing archive and press "SFX" button. In the WinRAR shell you can select the desired SFX module from the list displayed when executing Main menu > Tools > Convert archive to SFX command. If an archive is already self-extracting, using the command "Convert archive to SFX" will give you options to, "Do not change SFX module", "Add a new SFX module", or "Remove the already existing module from the archive". In this case WinRAR does not touch the original archive and creates a new archive with the same contents, but without self-extracting module. There are so many ways to extract files/folders from an archive in WinRAR. It is really on the preference of the user what he will use. See examples below. (1) Double-clicking or press "Enter" on the archive name in the Windows Explorer window or Desktop. If WinRAR was associated with archives during installation, an archive will be opened in WinRAR. You may also associate WinRAR with archives after the installation using the Integration settings -- Main menu > Options > Settings > Integration. (2) Double-clicking or press "Enter" on the archive name in the WinRAR window itself. (3) Drag-and drop an archive to the WinRAR icon or window. Before doing this ensure that WinRAR does not already display another archive, otherwise the dropped archive will be added to the currently displayed archive. (4) Run WinRAR from the command-line with a single parameter - the archive name. When an archive is opened in WinRAR (archive management mode) its contents are displayed and can be viewed. Select files/folders you want extracted. Selecting one or more files, click the "Extract To" button at the top f the WinRAR window and click "OK". The "Extract To" dialog box also offers a few advanced options. During the extraction process and want to "minimize" it and let it run in the background, there is a "Background" button that you can use. If the extraction is completed without errors, WinRAR will return to the shell, in case of an error, a "Diagnostic message" windows will be displayed showing the error/info. You can stop the extracting process anytime. Just click the "Cancel" button in the command window to stop it. This will be easier if you have enabled "Integrate WinRAR into shell" option when installing WinRAR. Select the archive file/s you are going to decompress, in Explorer or Desktop, "right-click" mouse button on the selected files and choose "Open with WinRAR" --WinRAR shell will open, "Extract files..." -- enter the destination desired folder click "OK", "Extract Here" --to current folder, and "Extract to <folder name>\" -- without additional requests. mouse button then drag the selected archive to the selected folder destination. For beginners, the "Extract To" button in the WinRAR window or the "Wizard --unpack an archive" will be much simpler. Please see images above. Archive extension is optional and may be omitted. to extract all files with EXE and COM extensions from the archive TOOLS to the current folder. If you wish to stop the the extracting process just click the "Cancel" button in the command window. If you want to "minimize" it and let it run in the backgroud, there is a "Background" button that you can use. If the extraction is completed without errors, WinRAR will return to the shell, in case of an error, a Diagnostic message window will be displayed. The easiest way to test an archive for errors is either by double-clicking the target archive (this opens the archive inside WinRAR shell -- archive management mode), by selecting the target archive > right-clicking in Windows Explorer > Test archive or by selecting the archive > right-clicking > Open with WinRAR. When the archive file opens in WinRAR you just select "Test" button at the top of the WinRAR window. All errors found during test are displayed in the "Diagnostic messages" window. If no errors are detected, WinRAR will display a corresponding message. "Test archived files" can also be availed via the Main menu > Commands > "Test archived files" or via the Alt + T keyboard shortcut. See images below. To "view" the files/contents inside an archive you can either use Main menu > Command > View File, or click on the "View" button in the WinRAR window or via keyboard shortcut -- Alt+V. In the "View file" command, WinRAR shows the contents of the file under the cursor in the internal viewer window regardless of the file contents or configuration settings, but if you were to press Enter on a file name, several different results are possible. If the file under the cursor is an archive, WinRAR will open it and display its contents, otherwise further actions depend upon them settings specified in Viewer settings dialog. With this dialog you may force WinRAR to always use the internal viewer, to open the file in the external viewer, to call a program associated by Windows with this file type or to ask, each time before viewing the file, which action described above should be executed. WinRAR can be used to view normal files, whether in an archive or not. If an external program is called to view an archived file, WinRAR unpacks this file to a temporary folder, passes its name to the external program and waits for the program to terminate. 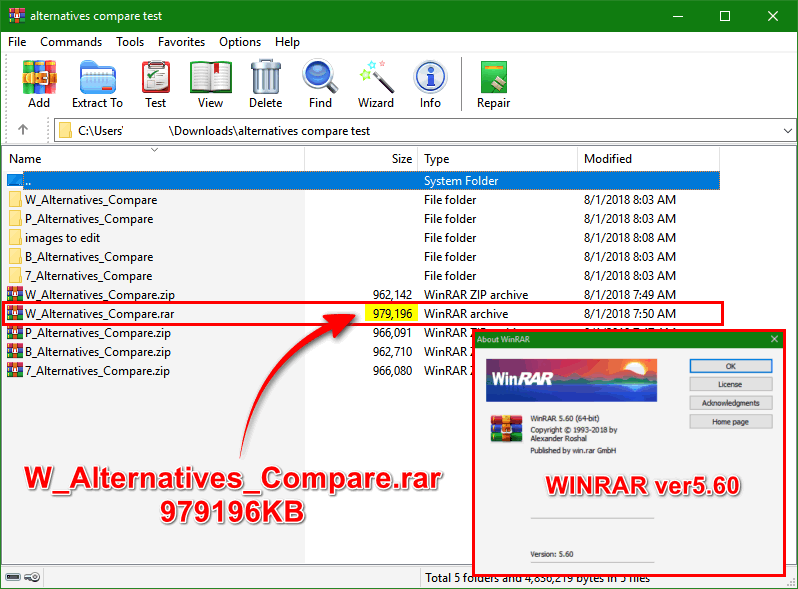 After this WinRAR tests the file modification time and if it was updated, offers to update this file in the archive and then deletes the temporary folder with the extracted file. Note that the scheme described above is slightly modified, when Enter is pressed on an archived file, which has .exe extension. In this case WinRAR extracts not only this file, but the complete contents of the archive to the temporary folder and then runs the executable file. The following steps are similar to those described above: WinRAR waits for the executable to terminate, then tests the modification time of the extracted files and if changed or if new files were created, offers to update the archive. The temporary folder and its contents are then deleted. This method of processing .exe files allows programs to be run directly from an archive. For example, you may use it to install new programs without unpacking a distributive manually, simply enter to an archive and press Enter on setup.exe or install.exe program. See images below. The "Delete" command is accessible both in file management mode and in archive management modes. User should be wary of the differences between deleting in both basic states/modes. In file management mode anything that is deleted (selected files and folders, etc) goes to the Recycle Bin. This is like you are in Windows Explorer. So you have the chance to restore accidentally deleted data. File management mode also allows you to delete files permanently (for advanced users). Using the keyboard, press "Shift+Del" instead of "Del" key to avoid moving files to the Recycle Bin. "Shift+Del" command silently deletes even files with read-only and system attributes and permits to delete files with non-standard names, such as with trailing spaces and dots. Usual Recycle Bin based delete can fail to process such names. In archive management mode the selected files and folders are deleted from the archive completely/permanently, without any possibility of restoring them. Remember that you, (the user) is working inside the archive. Anything deleted inside the achive is deleted permanently (and not confuse yourself with deleting in file management mode where anything deleted goes to the Recycle Bin). Here in archive management mode, there is no "Recycle Bin" so you need to be careful. To command use either Commands menu , button "Delete" on the toolbar, Alt+D or Del keyboard shortcuts. See images below. This command is accessible both in file management and in archive management modes. Using "Find files" dialog it is possible to search for files contained the specified string either in the opened archive or in selected folders or disks. Dialog items are described below. By default it contains "*", what means to check all files. You may enter other file mask here, for example, "*.txt" to search only in .txt files. It is allowed to enter several file masks separated by spaces. If you need to specify a file name containing spaces, enclose it in quotes. Here you may enter a string to find. If you leave this field blank, WinRAR will display all files matching other specified criteria. Enables case sensitive string comparison. Use ANSI, Unicode and OEM (MS DOS) character tables when searching for string. If this option is off, WinRAR uses only the default Windows character table (ANSI) in the search operation. Treat the entered string as sequence of hexadecimal values separated by spaces. This field contains list of disks, folders or archive names to search in. Also you may select predefined <Current folder>, <Local hard drives> also as separate disks from the drop down list. Archive types to search in. By default it contains "*", what means "all archive formats", but, for example, you may enter "*.rar" to search data only in rar archives. It is allowed to enter several archive masks separated by spaces. Because of technical limitations WinRAR is not able to search for text in ACE archives, other formats supported by WinRAR are supported here. Forces WinRAR to search not only in the specified folder, but also in its subfolders. If enabled, WinRAR will search in usual not archived files matching the specified file name. Enables to search in the archived files. You may set both "Find in files" and "Find in archives" to search a desired string both in archives and in usual files. If password is required to search inside of encrypted archive, such archive is skipped silently. This button saves the current state of dialog, so it will be automatically restored when activated next time. See images below with a wildcard "*.JPG*" to search for all ".jpg" or JPEG files inside the target archive. 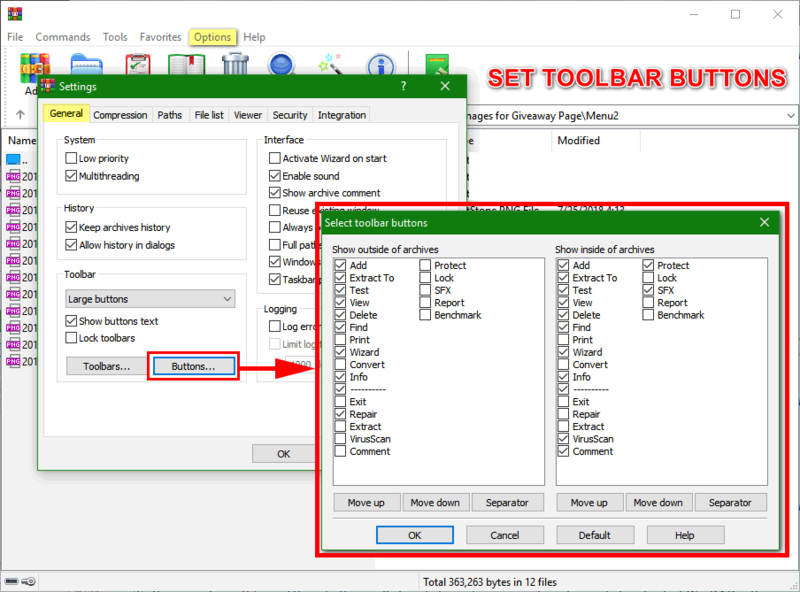 WinRAR Wizard is designed for novices (like most of us who have been using WinRAR) and allows to perform basic compression and decompression operations using the simple step by step procedure. For new users WinRAR has it's Wizard for guidance. To use it, click the "Wizard" button on WinRAR toolbar to display the wizard dialog. By default this button is visible both inside and outside of archives, but you may disable or enable it like other toolbar buttons with "Select buttons…" in "General settings" dialog. (Another option of the same, "General settings" dialog, "Activate Wizard on start", allows to run Wizard every time when WinRAR starts). Every Wizard dialog contains a brief instruction at the top, describing dialog contents and possible user actions. You may also press Help button to get more detailed instructions. Clicking the "Wizard" button will show a dialog box "Choose operation" where you are given 3 options, namely: (1) Unpack an archive, (2) Create a new archive, and (3) Add files to already existing archive. Selecting this will unpack/decompress or extract the contents of any archive. Click "Browse" button, locate your archive, put the cursor to its name and press "Open". Also , instead of using "Browse", you may drag the archive icon and drop the icon to this dialog. After archive selection, click "Next" button at the bottom of dialog. You will need to select a destination folder for the unpacking process to begin. Click "Finish" to start the unpacking process. Selecting this will allow you to create a new archive. The next dialog box will ask you to "add files/folders" that you wish as contents of your new archive. You have to enter a name for your archive. WinRAR usually will propose a "name" for the new archive but of course it will be on you if you will accept it or enter your preferred name. If "Default folder for archives" option in WinRAR settings is not blank, WinRAR will propose to create an archive in this folder. Otherwise the proposed name does not include the path and archive will be created on Desktop. If you wish to create it in another folder, click "Browse" button, find a folder to place the archive, enter an archive name in the "File name" field and click "Open". A dialog box will appear asking you further options where you can opt to a "Faster, but less tight compression", Delete files after archiving", "Create self-extracting (.exe) archive, Set password for your archive, and splitting you archive into several parts. Click "Finish" to execute. "Add files to already existing archive" option, you will be prompted to "Select files to add" dialog box, where you need to select those files, and add it to the archive of your preference. The next dialog box will ask you to name the target "existing" archive or you can just lick "Browse" and locate the archive manually. A dialog box will appear asking you further options where you can opt to a "Faster, but less tight compression", Delete files after archiving", Set password for your archive, and splitting you archive into several parts. Click "Finish" to execute. A note on setting passwords before using this wizard option "Add files to already existing archive", when you set a password for the files you wish to add to your chosen-existing archive, WinRAR will only implement that password protection to those specified files and not the whole archive you are updating. The "Info" button is the "show information" command and can also be accessed via the Main menu > Tools > Show Information, or via the "Info" button in the toolbar of WinRAR window. Shows you the information about contents of selected archive : the total size, a number of files and subfolders, a number of archives. To improve the operation speed, archives are detected basing only on the file name extension, so self-extracting archives are not counted here. File scanning may take a long enough time, but if you wish you may close the dialog in any moment. Other pertinent options are given in the dialog box are "Options", "Comment" and "SFX". The images will also show the improved graphs of the "Show Information" for WinRAR ver5.6. List of antivirus software installed on a computer and identified by WinRAR. If this list contains several virus scanners, you may choose anyone which you like. If the list contains only "User defined" item, it means that WinRAR could not find any antivirus software and you need to specify a scanner name and parameters manually. Name of virus scanner executable. You need to modify this field only if WinRAR cannot find antivirus software installed on your computer and "Virus scanners found by WinRAR" list contains only "User defined" item. In such case you need to press "Browse" button and locate a virus scanner .exe file, which will be called by WinRAR to check unpacked files. In this test I used Emsisoft Anti-Malware as my virus scanner. See image below including the scan report of Emsisoft Emsisoft Anti-Malware. Parameters passed to your virus scanner. You need to modify this field either if WinRAR cannot find antivirus software installed on your computer or if it passes invalid parameters to virus scanner. For example, it may happen if command line syntax of antivirus program is changed in a new version. Usually virus scanners require only one parameter - the name of folder containing unpacked files. WinRAR denotes this folder as %f. Since its name may include spaces, it is necessary to enclose it in quotes, so most likely you need to place "%f" string to this field. Though, some scanners may require additional options, which can be found in their documentation. If you use only one antivirus and do not need to modify its parameters every time, you may skip the virus scanner selection dialog by turning "Propose to select virus scanner" option in Security settings off. In this test I used Emsisoft Anti-Malware as my virus scanner. See image below including the scan report of Emsisoft Emsisoft Anti-Malware. If WinRAR considers an archive/selected files as corrupt it will attempt to repair them. The "Repair" command can be used either "Main menu > Tools > Repair archive" or via the "Repair" button on the toolbar. WinRAR is able to repair only RAR and ZIP archives. WinRAR tries to detect the type of the archive automatically using archive data and extension, but user also may set an archive type manually. The source archive is not changed and result of operation is stored into a new archive, which is named fixed.arcname.rar or rebuilt.arcname.rar, where 'arcname' is the original archive name. Success of "Repair" operation depends on the archive type and type and size of damaged area. Chance of successful RAR archive repair is significantly higher if it has the recovery record. If archive does not contain the recovery record, chances are lower for solid archives and no repair is possible for archives with encrypted file names. See image below with the new archive "rebuilt.Add files to already existing archive.rar". See image below with comparison to previous versions. 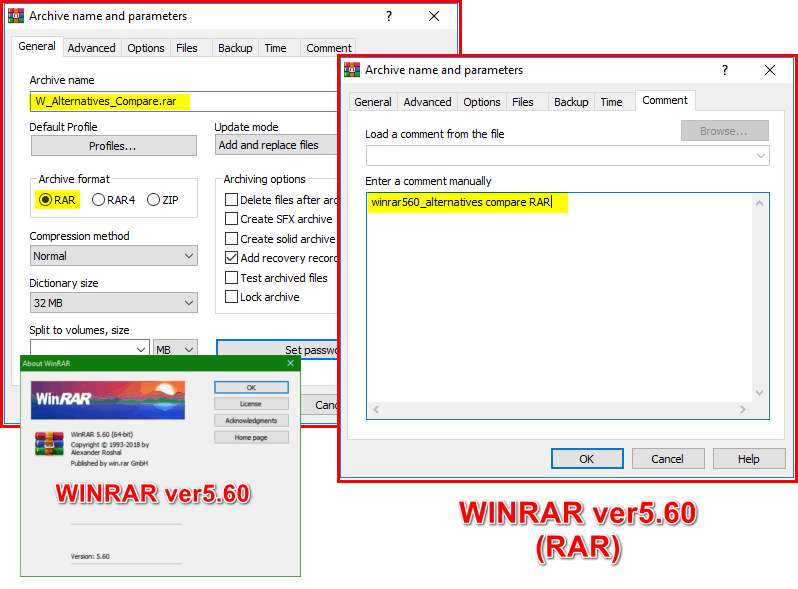 In WinRAR 5.60 "RAR" (default archive format which started in WinRAR ver5.50) is the former RAR5 of previous WinRAR versions. 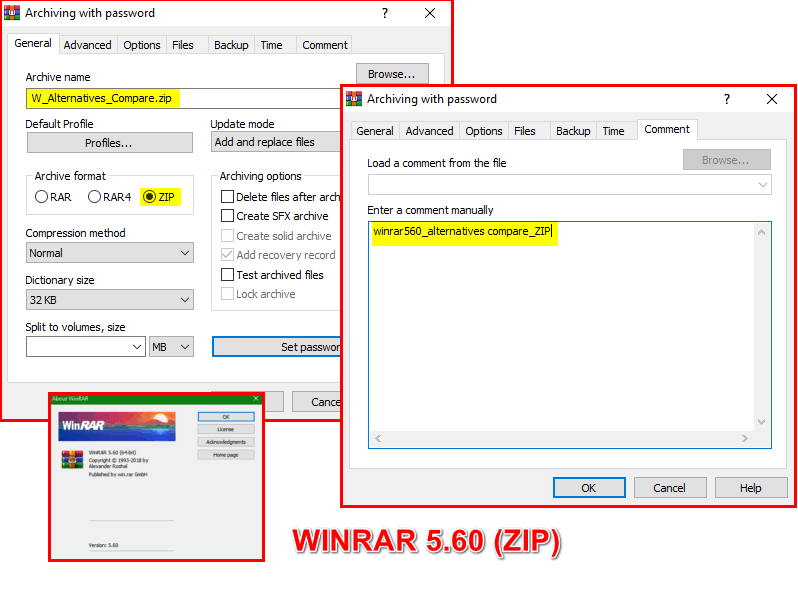 This re-enter password prompt when a wrong password is entered when opening or unpacking RAR archive with encrypted file names is ONLY applicable when you select "RAR" in "Archive name and parameters > Archive format" (WinRAR ver 5.60) during archive creation. If you select "RAR4" in "Archive name and parameters > Archive format" there is no second prompt because there is no possibility to distinguish a wrong password and corrupt archive data in this archive format. 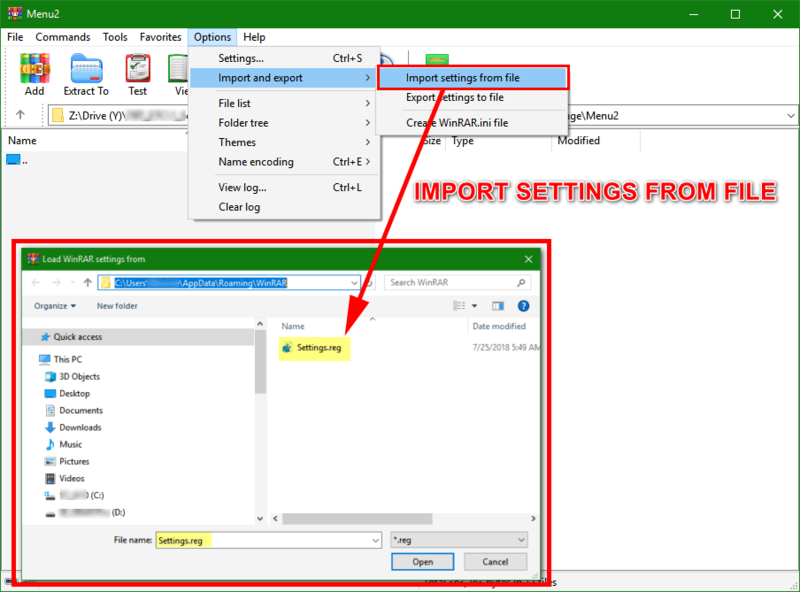 To manually set archive format default, user can go to Options > Settings > Compression > Compression profile > Create default and set "RAR" in Archive format. See explanation from WinRAR support below. prompt when password is valid and archive is damaged. RAR5 archive format, which is just the default RAR in latest version, allows to detect if password is wrong and does not confuse it with broken data. So we can issue a new password prompt reliably. Compression ratio graph is updated in WinRAR 5.60. This is ONLY applicable when you do a clean install of WinRAR ver 5.60. If you do an "install over" existing WinRAR installation (say, you have WinRAR ver 5.31/WinRAR ver 5.50 and you install over it using WinRAR ver 5.60) then the previous default of "B -- bytes" is applied. To manually set compression default, user can go to Options > Settings > Compression > Compression profile > Create default and set "MB" in Split to volumes, size. WinRAR offers a 40day trial usage of without limitations of its features. At the end of the 40 day period a license is needed to further use it. Der.Reisende, wwd, grr and 2 others like this. WinRAR as archiver is pretty much very simple to use and reliable. The interface has been improved and it's a bit more nicer with all the new graphic image that was updated. Taking a closer look at the "What's New" contents I have discovered that there are some information there (when you check/try it out) I have encountered issues. Specifically #12 and #20 in What's New -- (see "Re-enter password prompt (RAR)" and "Megabytes as default units for volume size" above). On both instances the test did not let me see what they have printed/stated and I had to send WinRAR support the sample archive including the images to verify my test. Their reply was that they "missed" to mention that #12 will not work with RAR4.x archive format and #20 will only be seen when a user does a clean install of WinRAR 5.60. If a user opts to do an "install over" previous installation then it will adapt the previous default which is "B-bytes". Some of this information were deemed "not relevant" or "insignificant" by WinRAR support themselves. Perhaps they can be more "specific" even when it seems "insignificant". Information should be ready and at-hand since this is a new build and introduction of a new product version. If a user disregards it then it's up to him. But to those who do not then it's relevant. WinRAR support was professional about my inquiries and have stated some workarounds for the issues and also some further questions about licensing (for giveaways/contest and paid users). They also replied the next day and explanations were very good. 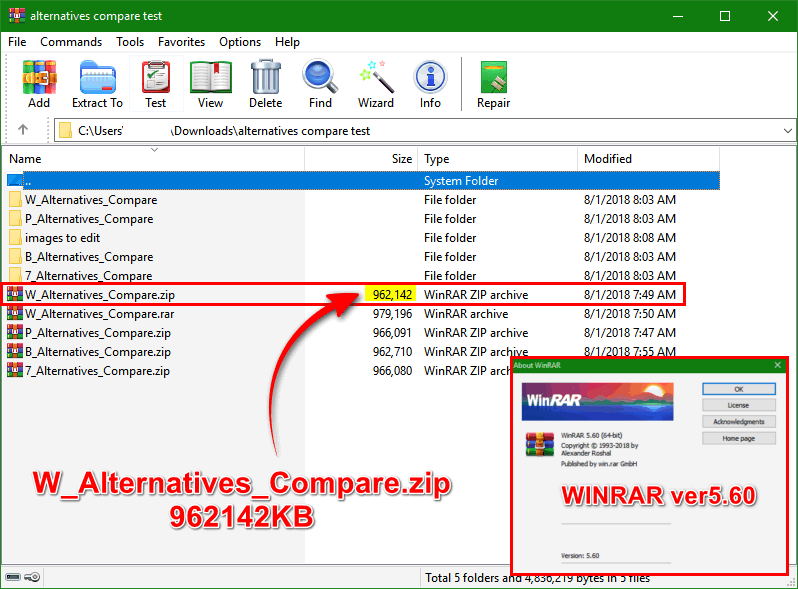 In a simple comparison to other alternatives (freeware) via a short ZIP archiving for a small 3.10MB folder, WinRAR 5.60 has the smallest size (at 962142 KB) as compared to 7ZIP's 966080 KB, Bandizip's 962710 KB and PeaZIP's 966091 KB. In archiving speed all took only seconds to complete archiving the same folder. I tested with the same normal compression and ZIP archive format to a much larger folder with a 5.97 GB size. 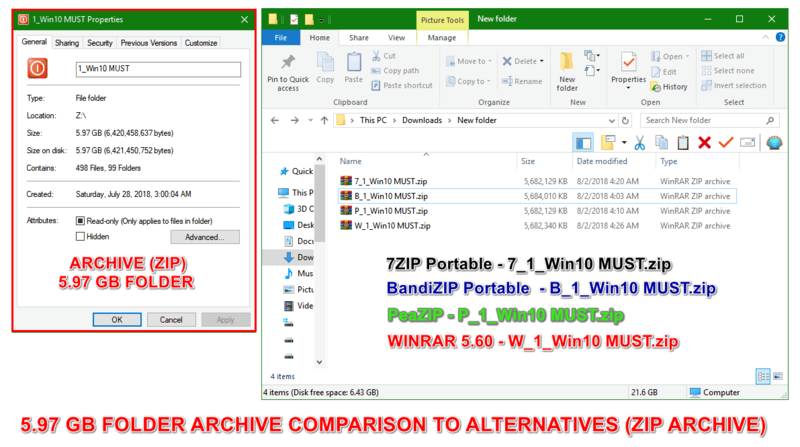 WinRAR 5.60 was 3rd in size of ZIP archive at 5682340 KB. 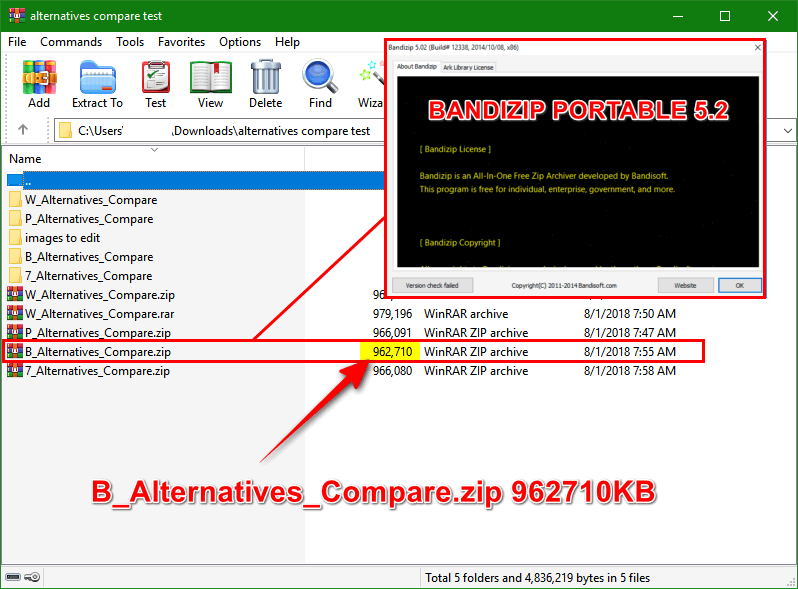 Bandizip was the largest at 5684010 KB. PeaZIP and 7ZIP was he same at 5682129 KB which is the smallest size. In speed Bandizip blew them all away with a 1 min 40 sec archiving time. WinRAR 5.60 at 2 min 50sec. 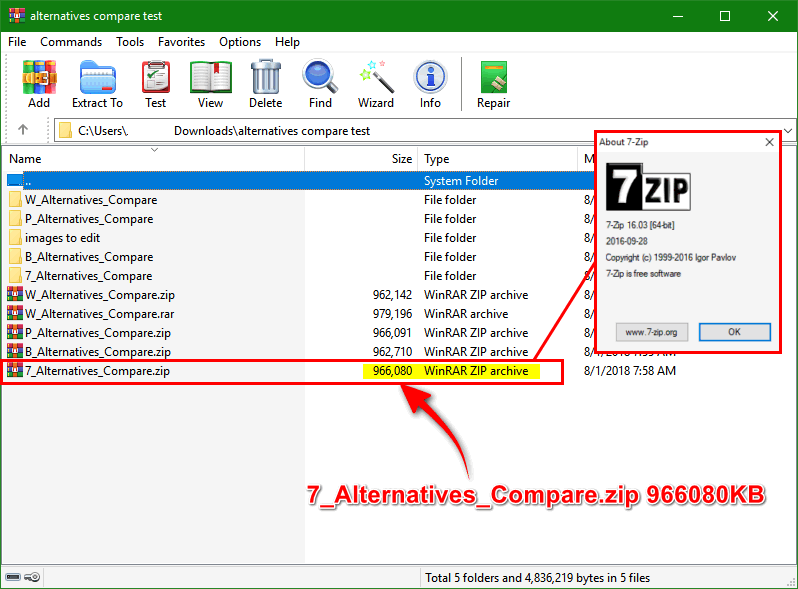 PeaZIP at 4 min 45 sec and 7Zip was the slowest at 4 min 50 sec (see 5.97 GB Folder ZIP Archive Comparison image above). Aside from the archiving time (and price) all 4 archivers are at par in terms of performance and reliability. WinRAR lives up to it's name as full-featured archiver with special mention to continuous product development and WinRAR support for all relevant information given/explained especially on the "What's New" and the license reminder above. It will remain as my top 1 and favorite archiver. Der.Reisende, wwd, grr and 3 others like this. Der.Reisende, RGiskardR and jasonX like this. jan13, Der.Reisende, wwd and 1 other person like this. Very detailed and complete review! thanks!!! Der.Reisende and wwd like this. It was worth spending so much time on the review. WinRAR is a very good program. Der.Reisende and RGiskardR like this. My favourite packer solution for years! Thanks for the in-depth-review @jasonX! I am posting this in connection with soemthing that has happened to me at PZD forum with regards to a review I poste there for WinRAR ver5.60. You can attach a sample to it too but if there are size restrictions better upload it to a file hosting site and just include the file link to your email. WinRAR support and developers are always willing to help you out. If there are no responses (which I doubt) as I have been sending them from time to time about issues I encounter, send word to me with the details and I will follow-up your email to the WinRAR developer myself. Just give me the details via email (screenshots perhaps of your email). You can ask any winner here for my email. Thanks all this has been a great run here!